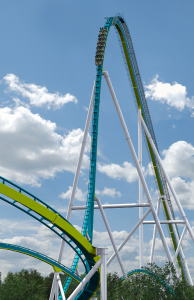 First Rider Auction for Fury 325 Announced! The worlds tallest and fastest giga coaster is set to open very soon but first, you can bid on the chance to be one of the first public riders on this amazing new coaster. All proceeds going to the Cam Newton Foundation. Invitation to the private media opening for Fury 325 for one (1) person on Wednesday, March 25, 2015* to ride in the seat you bid on. Two (2) Regular Single Day admission tickets valid any public operating day of the 2015 season. One (1) Large Fury 325 First Rider Charity Auction T-shirt. One (1) Fury 325 First Rider Auction Hat. One (1) Autographed football by Cam Newton. Gourmet Lodge: Explore the exotic flavors of Gourmet Lodge, featuring duck confit, venison chili and other exciting dishes. Savory Tavern: Tempt taste buds with the rich flavors of Savory Tavern, including coconut shrimp cigars, braised lamb shank and passion fruit flan. Chef’s Plantation: Pan-seared salmon cakes, a griddled cheese cake sandwich and more await your palette at Chef’s Plantation. Coast to Coast Cookery: Flavors of the land and sea come together at Coast to Coast Cookery, featuring hangar steak, bacon-wrapped prawns and more. Field House Eatery: The Field House Eatery is the Festival’s biggest location, offering pan-seared scallops, roasted pork belly and mango éclairs right on Gwazi Field. Southern Station: Southern Station tantalizes taste buds with shrimp & grits, pan-fried cod and beef short rib. Comfort Kitchen: The Comfort Kitchen fuses classics like bacon mac & cheese with contemporary eats like habanero shrimp salad. Light Fare Canteen: Freshen up your palette at the Light Fare Canteen with scallop ceviche and an heirloom tomato & goat cheese salad. Blazin’ Bistro: Blazin’ Bistro breaks out the grill for fire-braised pork chops and jerk chicken sliders. The Busch Gardens Food & Wine Festival runs from noon to 9 p.m. on Saturdays and Sundays, March 7 through April 26. Plus, raise your glass to live concerts at 6 p.m. on Gwazi Field. The Festival is included with any pass, Fun Card or daily admission. Food and beverages are available for purchase at an additional fee. For more event information, including detailed menus and a full list of wine, craft brews and cocktails, visit buschgardens.com. Stay connected and join the conversation by using #corksandcoasters on Busch Gardens’ Facebook page, Twitter and Instagram. Check out this years version of the Mardi Gras parade at Universal Orlando resort filled with colorful floats, tons of beads & plenty of scantily clad good looking men and women. Ft. Worth, TX (February 9, 2015) — The DreamVision Company, a Fort Worth-based privately owned entertainment and media enterprise, today announced plans for two multi-billion dollar theme parks and the addition of executive Dave Goodman as president of DreamVision Theme Parks and Resorts. DreamVision CEO Rick Silanskas says the parks are being developed in partnership with Bryan Robinson, CEO, Provident Global Capital, LLC. “We are very excited about our partnership with DreamVision and their team of proven industry leaders. Even more compelling is how DreamVision aligns with Provident Global Capital’s core values and our mission of investing in companies that have a positive impact on society,” said Robinson. Located in Fort Worth’s Metroplex region and slated to open in 2020, DreamVision Mountain/DreamScape, Texas will transport guests through multiple themed lands and attractions. Rising up in the center of the park will be the iconic DreamVision Mountain, a towering winter wonderland and one of the largest indoor winter snow experiences in the world, featuring winter sports like skiing, snowboarding and bobsledding. The realistic winter landscape, inspired by the artwork of Thomas Kinkade, will be created by technology developed by Malcolm Clulow, the foremost expert in indoor snowmaking. Themed lands, including Dreamscape Tinsel Town, Nadia’s Storybook Land and Dreamscape Metropolis, will surround DreamVision Mountain, each offering unique attractions, rides and adventures. Plans for a second theme park in Muscle Shoals, Alabama will be announced February 11 at an 11 a.m. CST press conference at the Marriott Shoals Hotel. According to Rick Silanskas, the company has already begun pre-development on the parks. “Although they are being built simultaneously, each has separate themes, rides and attractions that embody the DreamVision family brand,” he said. Since 2002, Silanskas, a producer, musician and composer, who has created award winning work for the motion picture, television and animation industries, has assembled a team of top entertainment industry professionals, among them chief creative officer Ron Logan, previously executive vice president and executive producer for Walt Disney Entertainment and the force behind the Broadway production of “Beauty and the Beast,” and president Vince Silanskas, a former Walt Disney World executive. DreamVision has added Dave Goodman, a longtime entertainment executive, to head up the theme park division. Goodman is a former vice president of entertainment and executive producer at Disneyland Resort and has held executive level positions at Walt Disney Special Events Group and Busch Entertainment Corporation.